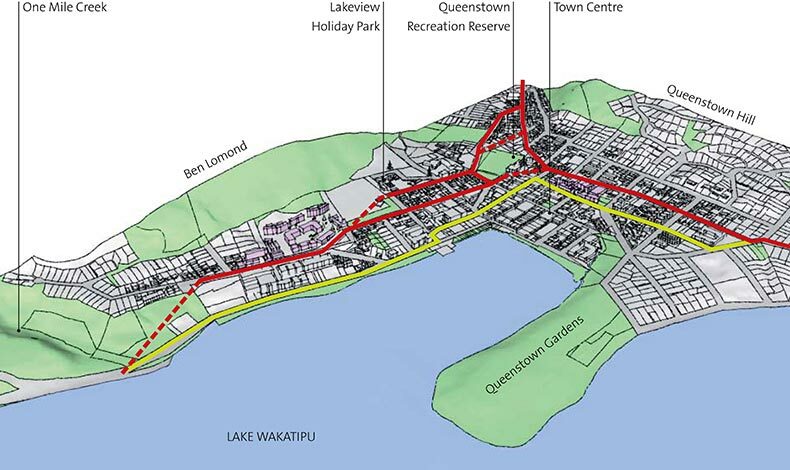 Boffa Miskell was engaged to provide urban design advice to the Queenstown Lakes District Council on options for alternative transport links around the fringe of the Queenstown Town Centre. The Council had engaged MWH transport engineers to undertake the study and urban design was identified as a key driver influencing the study outcomes. The transport link chosen as the preferred option needed to enhance visitor experience to Queenstown as a premium resort town as well as cater for local movement needs. The study involved assessment of a wide range of high-level options to assist Council’s decision-making process and ultimately urban design values would need to be integrated into detailed design and implementation. Boffa Miskell also contributed to the consultation material and presented options to the Queenstown Urban Design Panel.